Tread lightly, for you are embarking down a craggy spiral on a journey from which the only return is through the cardiologist's office. It is 6:59 AM and you are standing out in the damp, brisk air of a Portland morning, breathing into your hands to restore the circulation, a function that will cease after ingesting the artery-clogging behemoth that lies behind the weather-beaten wood and glass door. One of the young employees works the lock, and you can tell by the smile on her face that she is invincible, the rest of her life stretching out before her like the interstate - unless she falls prey to the come-hither of the home-style Frankenstein monster that goes by the seemingly harmless moniker of "The Reggie". The incandescent lights dangling from ancient fixtures give an eerie glow to the single room in a tiny box, a nondescript structure that may have served as a barber shop in a previous life. There's a counter hugging the wall and several tables that hint that as the morning progresses they will become communal. You have entered the belly of the beast with a goal to escape triumphant, celebrating your victory over The Reggie with another notch in your belt (and trust me, you're going to need that extra notch) - you are at the counter at Portland's Pine State Biscuits. If you have some level of difficulty finding the words "biscuits" and "Portland" to be a match made in heaven, fret not; Pine State Biscuits is the brick-and-mortar child of Tar Heels Walt Alexander, Brian Snyder, and Kevin Atchley, transplants with white gravy flowing through their veins who took shelter indoors in 2008 after introducing Portlanders to the powdery flour cakes at the Portland Farmers Market. It is highly recommended to arrive early - seating is at a premium and the dining area fills up remarkably fast. 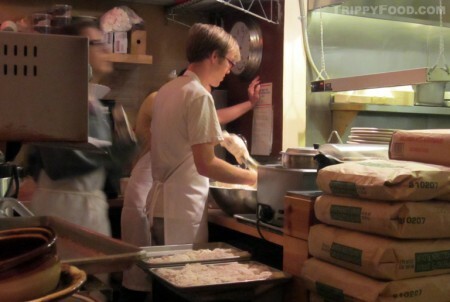 The blackboard menu dangles from chains above the counter, a chest-high wall that offers a view of the staff whipping up batches of the day's biscuits surrounded by massive sacks of Shepherd’s Grain flour like doughboys behind sandbags in the trenches of Bentonville. 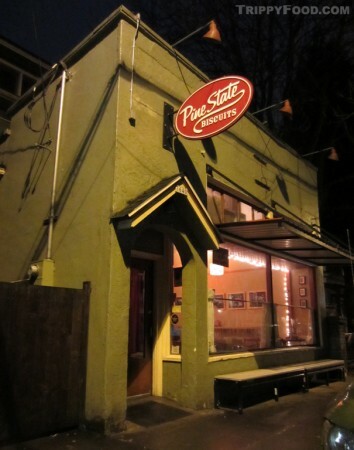 Like many Portland restaurants, the doors stay open while the morning's supply starts to dwindle; once the biscuits are gone, so is your opportunity to conquer The Reggie. 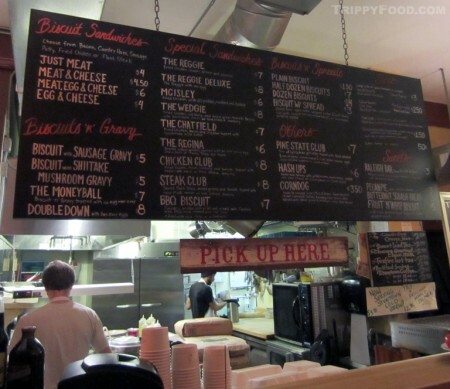 Pine State Biscuits offers a fleet of biscuit-based dishes, some with cryptic names like the McIsley and the Chatfield, others with formidable titles such as The Moneyball and the Double Down - of course, for the traditionalist there's the tried and true biscuits and gravy. Deciphering the mind-numbing variety of options can be overwhelming, but your first visit should feature Pine State's most popular selection, The Reggie. This colossal biscuit sandwich is Pine State's most popular plate, an imposing biscuit structure that was reduced to rubble in Guy Fieri's gaping maw on "Diners, Drive-Ins and Dives". The dish starts with one of the super-sized, flaky and sturdy buttermilk biscuits. 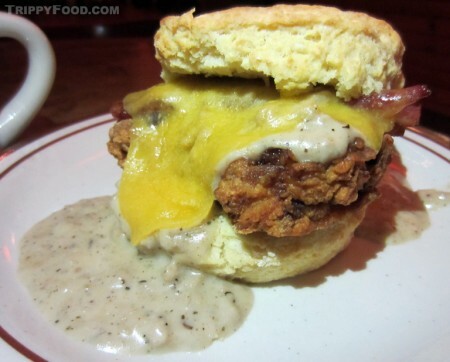 The bottom half is blanketed with a spicy slab of fried chicken which is then covered with cheese and strips of crispy bacon before being smothered in white gravy and capped with the top half of the biscuit. This gastronomic Mount St. Helen spews forth floes of hot, spicy magma in a cataclysm of Southern-style ecstasy that demands the use of a knife and fork. If you feel like taking a walk on the wild side, there's The Reggie Deluxe - the same cholesterolic Biscuit of the Apocalypse accentuated by a fried egg. This entry was posted in Portland, Oregon and tagged bacon, biscuits, Brian Snyder, buttermilk, Chatfield, chicken, Diners, Double Down, Drive-Ins and Dives, flour, gravy, Guy Fieri, Kevin Atchley, McIsley, Moneyball, OR, Oregon, PDX, Pine State Biscuits, Portland, Portland Farmers Market, Reggie, Shepherd’s Grain, Walt Alexander. Bookmark the permalink.